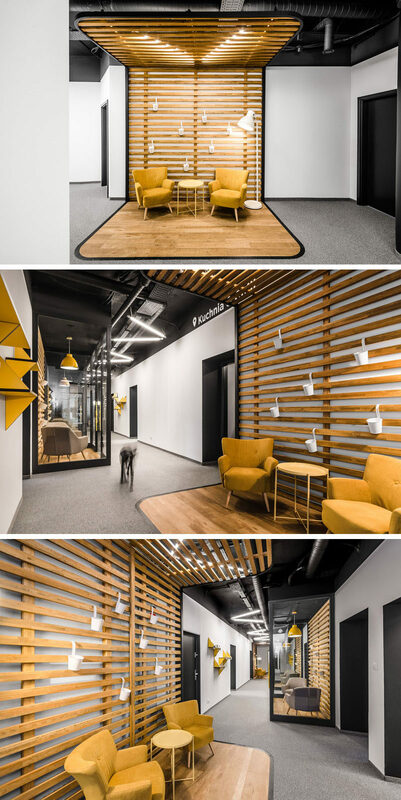 mode:lina architekci have recently completed a new office in Wroclaw, Poland, for Droids On Roids, a tech company. 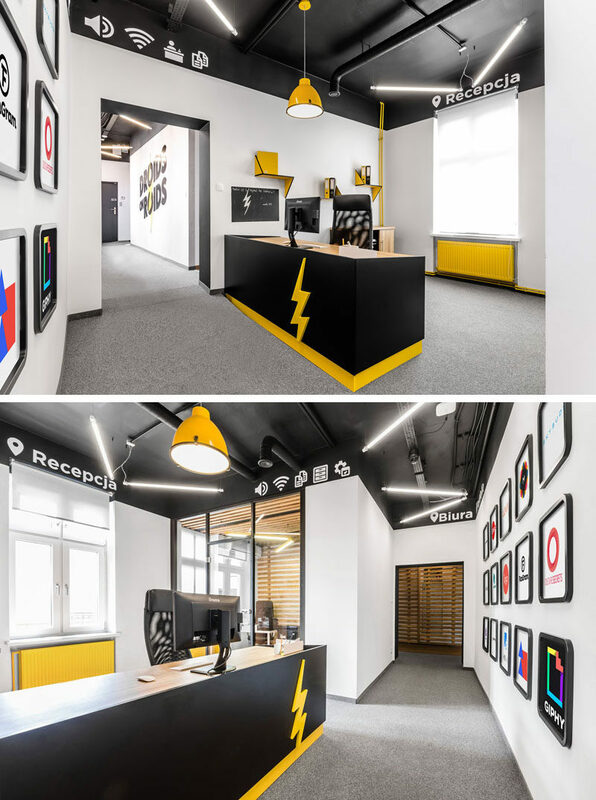 The design of the office takes inspiration from their logo, and throughout the space there’s references to the color and the lightning bolt. 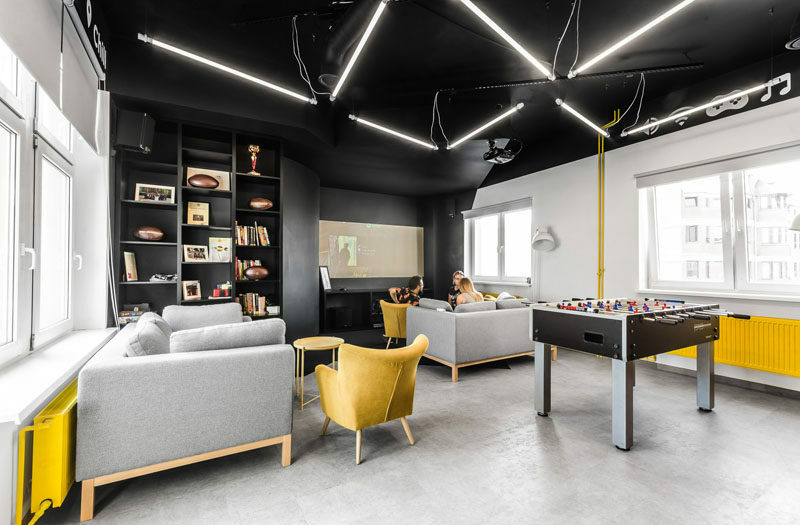 Throughout the office, like in the reception area, there are icons placed on a stripe resembling a status bar that allows people to easily identify the function of each space. Just outside the reception area is a hallway that has a clearly defined seating areas. Wood slats with a black frame wrap around from the ceiling to the wood floor. Between the two seating areas in the hallway are a couple of glass enclosed small meeting rooms. These small rooms allow people to have private meetings without being closed off from the space around them. These glass enclosed rooms also allow for fun artwork or photos to be attached to the glass, and the wood slats and flooring match the other seating areas in the hallway. 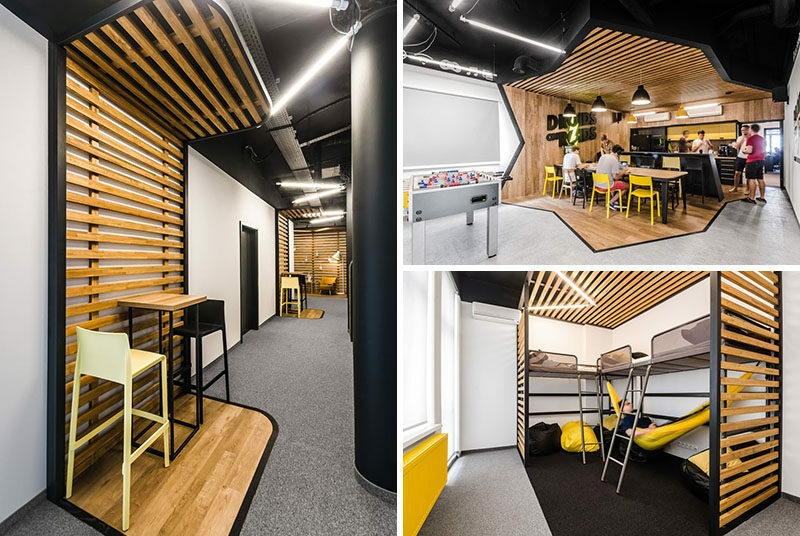 In another hallway, there’s more clearly defined seating areas, this time though the areas have wood bars with black and yellow seating. In the employee break room, the area is split up into two sections, the first being the kitchen and dining area. Diagonal lines that outline the wood have been used to clearly define the area, while the wood slats and wood wall create a contrast to the black and yellow kitchen. And the second area of the break room is the lounge. 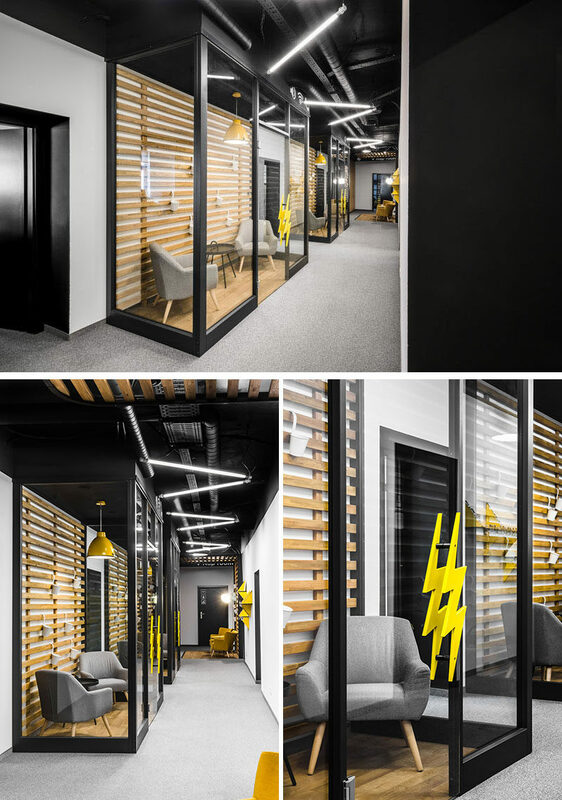 Zig-zag shaped lamps hang from the ceiling, and the yellow furniture elements tie in with the lightning bolt in the logo. 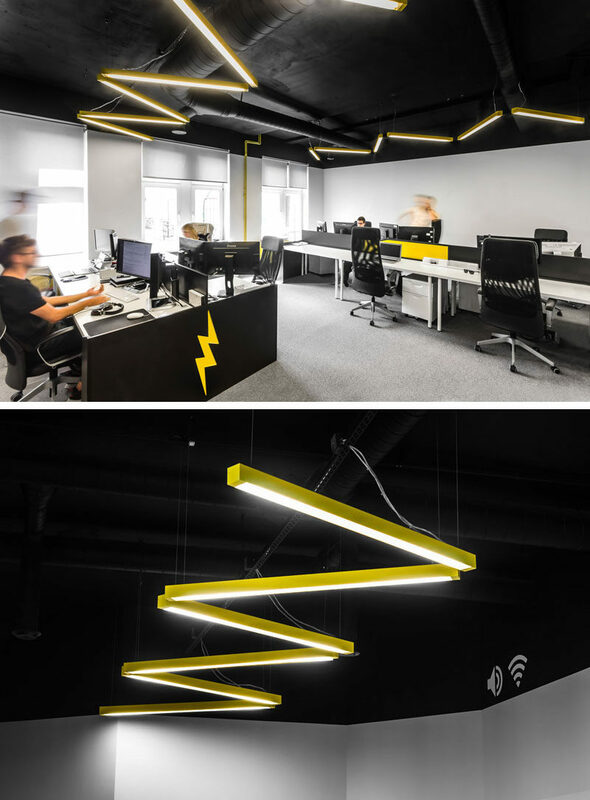 In the open plan work area, there’s yellow lighting arranged in a zig-zag form that’s a reference to the lightning bolt found in the company’s logo. 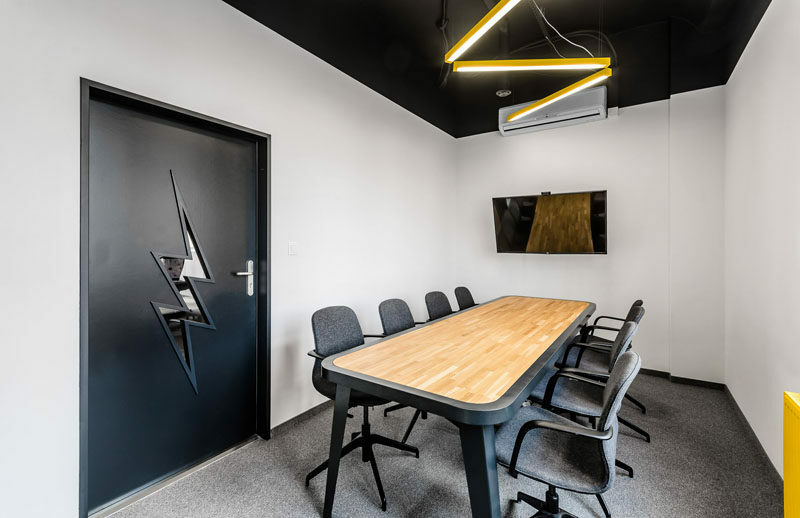 More lightning bolt inspired elements can be found in the boardroom with the overhead lighting and the window shape in the door. 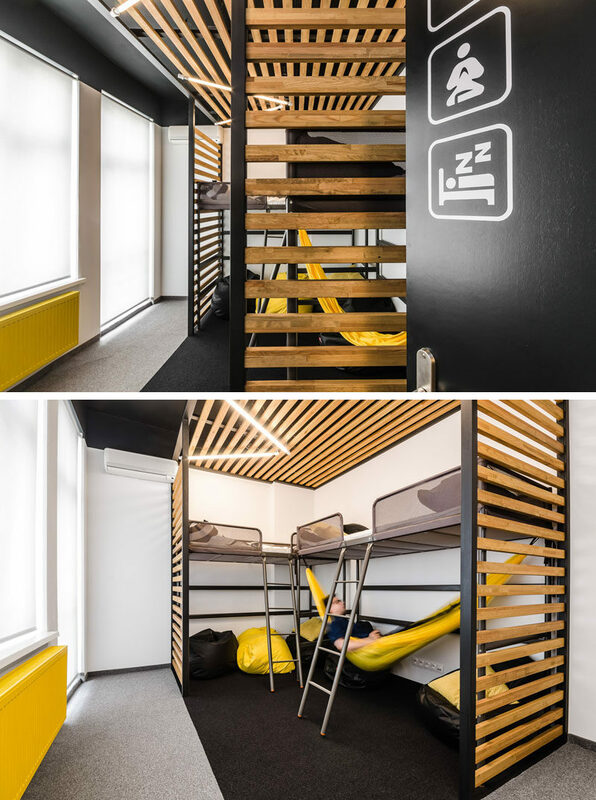 An added benefit of this office design is a nap room, where employees can take a quick rest in one of the beds or in the hammock. There’s also a few bean bag chairs to relax and have some quiet time.